Today is our last #hammocktime for Adelaide Fringe at Gluttony. Last year at our inaugural festival presentation at WOMADelaide we were fully booked by the end of our first day. In all four days we never had a single hammock empty and even extended hours to fit in a few more sessions. We shared the experience with over 180 guests across those four days. Every single one of them raved about it and many more were disappointed they missed out. Yesterday we had one guest, all day. Today we are looking at one booking. Sadly, that’s been the trend; in total we have shared this experience with 36 #adlfringe guests across a five week season working almost every day except Clipsal week. I know artists aren’t supposed to talk about money in public because it makes us look like whingeing doley bludgers, but I’m all about transparency and calling a spade a spade, so here’s the deets. We’ve earned $560 for the whole season – not including the 10% venue fee which Gluttony very generously allowed us to only pay on actual sales, not forecast sales (the latter would have destroyed us). In number crunching specificity, that’s 23 at $20 per session, 3 at $30 evening sessions, 1 at yesterday’s 1/2 price $10 offer and 9 at comps for Honeypot and Judges. Adelaide Fringe registration for this event cost $495. FringeTix takes an additional 10% straight from those sales (including a 30c charge if we issue a comp). We already had the hammocks and most of the set; fortunately I was already in Adelaide at the time so I didn’t have additional travel costs, and I live in a bus so I didn’t have accommodation costs (although I have spent $150 in parking fines, doh!). In total I’ve spent about $1,000 to make hammocktime happen at this festival, which is nothing by comparison to most independent artist’s costs. If my amazing team of guides hadn’t been willing to do this as volunteers I’d have been completely buggered. Hah, what am I saying? I AM completely buggered! I never set out to make myself rich from art (or from anything, for that matter). I’m an activist far more than I’m an artist and my #lifestylechoice is my own decision for which I accept responsibility (for both ‘success’ or ‘failure’). Before anyone snarks (as sadly so many have done, jumping on this festival’s furore bandwagon with something more akin to victim blaming than nuanced dialogue) and blames me for my own inability to ‘make it’ … I am only too aware of my own failings: I am not the ‘sales person’ one is required to be in our contemporary Capitalist arts market. This particular live art social change experience is also not a commodity to be pushed down people’s throats. I struggle with anxiety and imposter syndrome and currently am not fuelled with the confidence required to ‘sell sell SELL!’. No one’s ‘fault’ but my own, I absolutely own that. But honestly, what’s far worse for me than not recouping my costs (or having additional $ to be able to give my volunteers some actual cash for their boundless efforts) is the soul destroying sadness of sitting all day looking at empty hammocks. I have learned a vast amount from trialling this project in this way and am grateful that I took the economic risk because of those huge lessons. We have also watched the powerful affect this experience has on the people who have come (which I wrote about in The Power of Pause). On top of everything, hammocktime has been critically acclaimed through a High Commendation and two nominations; one for BankSA Best Interactive Award and one for the John Chataway Innovation Award. Our team has been told by Honeypot guests that hammocktime is “the project everyone is talking about”… which is frankly epic. I couldn’t be more proud of the project’s intentions being recognised and felt, and the incredible energy that my volunteer guides have brought to this every single day. As I have said many times before in many threads around the furore, I do not blame #adlfringe for our small numbers and I have nothing but respect, admiration and love for all the humans who make these massive events come to life year on year. The team at both Fringe and Gluttony have been incredible support from start to finish. Heather personally has been a huge champion of the project. She was the one who encouraged me to try running this at Fringe, introduced us to Daniel at Gluttony and listed us as a Festival Highlight right from the get-go. She has attended twice herself and brought others along too. I know any form of criticism of an event that you run can be taken personally and I have to say again that this is not the intention. It hurts me deeply to think that my concerns, other independent artist’s concerns, have been taken that way. Those concerns are not with Adelaide Fringe – I know how hard it is to bring these things to life. I have worked at all levels of festivals around the world, including running them, for many many years. My problem, as I wrote after a private facebook status was published without permission in an InDaily article, is the ongoing and incredibly destructive onslaught of Capitalism on our arts world… and our world in general. This is my first solo artist experience at any Fringe Festival, which amongst other things means I don’t have a Fringe following. I wasn’t sure if I should even try delivering a work like this at a commercially-facing event, but I wanted to see how it would go. Having trialled the idea in many different contexts (including busking in Fremantle) I wanted to test the waters – I wanted to know if it would work as a ticketed event and whether that would make it possible for me to tour it around Festivals nationally and Internationally. My gut told me not to charge for this, but I was persuaded otherwise. Maybe I was wrong to charge at all, certainly I feel I was wrong to charge what I thought was a fair and ‘competitive’ rate of $20-$30 for a 30-45minute session. But I know that Festivals mostly don’t have commission budgets and if you can’t stand on your own two feet in those marketplaces, you won’t stand at all. 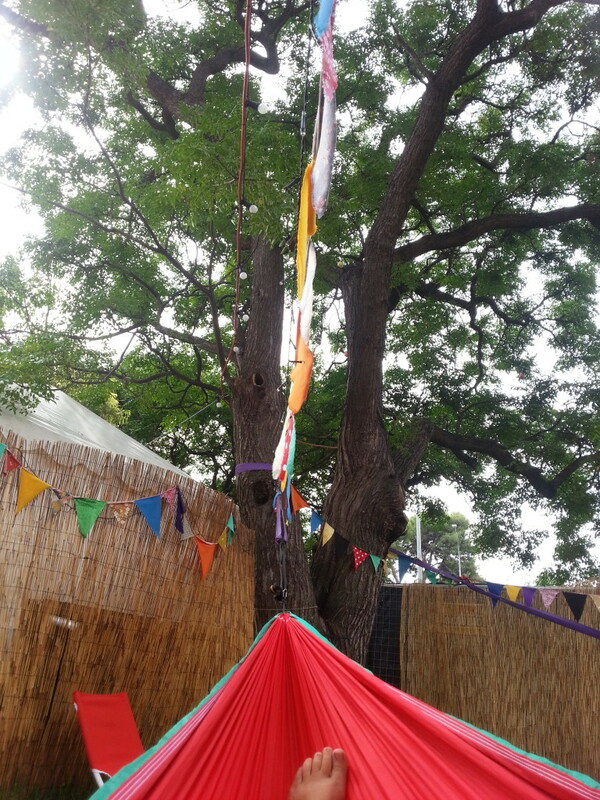 The upshot of all this is that in an effort to not end the Festival – which has been so wonderful in so many ways – by once again spending the day looking at empty hammocks, I’ve asked Ticketing to make all tickets free. We’re listed in today’s 1/2 price offer emailout, but as of about an hour ago if you go to book, you won’t be charged. I will, it’ll cost me 30c a ticket to give them away. I know most of our typical audience will be at WOMADelaide today, but for anyone who’s not and who wants to give it a go, either book through the usual systems or just rock up, we’ll almost certainly have room for you.